We design, craft, and repair jewelry right here in Washington State. 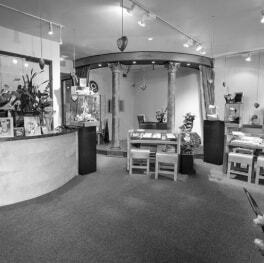 You can see our jewelers workshop through the windows behind the counter in our shop, and when you come to us for a consultation the people who first speak to you may be the very people who will be working on your jewelry thorough the entire process. From the first pencil stroke of a design to the last polish of the final piece, from the initial appraisal of a damaged heirloom to the completion of the repair, our craftspeople will be with your treasured piece throughout its journey. 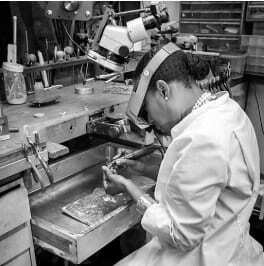 In an age of outsourcing and impersonal companies, there are few remaining in the USA who can guarantee that your jewelry will be cared for by those who work on it as you would cherish it yourself; and very few who can offer the quality of craft, detailed attention and honed skills that Margarette Elie has developed over the last 25 years. We have been in the jewelry business for over 25 years and we have learned that it takes great practice and skill to be a great jeweler. But it also takes great tools. And to give the level of detailed, attentive service that we insist upon to our customers, both the tools in our jewelry workshop and the skills to use them must be maintained on site. Over the counter of our store in Yelm you’ll see a fully equipped jewelry workshop, combining the traditional workbenches of the jeweler’s craft with a full array of the latest equipment: laser welders, wax mills and a 3-d wax printer, a Hermes engraving machine, gemological and stone setting microscopes, wet and dry polishing equipment, a faceting machine, a casting furnace, vacuum casting and centrifugal casting machines…. This means that every part of the work that we undertake is handled here in our workshop. When you come to us – whether for the repair of a treasured heirloom, or the design of a unique new creation – you know that every step of the process will be handled to the highest standards right here. To find out more, phone, visit or email us today.